Booked for the week after your course, free re-test included! We apply for your 5 year green Labourers card. Usually take 5 to 10 days after your CSCS Test! 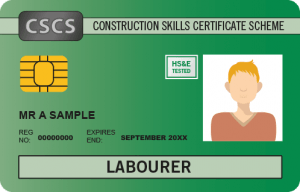 Let us take the hassle from you applying for your 5 year Labouring Card. This premium service is delivered every Friday in Hull. Your actual CSCS Test will be booked for the next available time slot the following week, if you would like us to tie it in on the same day as your premium package day, we would require at least 10 days notice, in this situation it is best to call us on 07570 893984 so we can check availability!